Last summer AMD orchestrated a top-to-bottom refresh of their GPU line-up, sun-setting the 200-series in favour of a more consistent (and somewhat more straightforward) 300-series with modestly bumped specifications for the next generation of PC gaming titles. Although no substantially new silicon was introduced into the lineup, it’s nonetheless fair to say that the new SKUs did also bring with them modest performance improvements and a more logical stepping in terms of performance and feature set. By placing the F9 Fury and Nano series above this in the product stack everything clicked into place, giving gamers a feature-complete range of options at seemingly every price point. Since the however summer pricing has naturally evolved as both major GPU manufactures have sought to drive demand, and as a consequence a fairly large hole opened in AMD’s line-up. Sitting pretty at ~£160 has been the Radeon R9 380 “Antigua Pro”, a design based on the R9 285 “Tonga Pro” GPU which was the first of the GCN 1.2 microarchitecture designs; considerably more expensive than that is the Radeon R9 390 “Grenada Pro” at ~£250. However at the time there wasn’t a convenient GPU to repurpose from their 200-series desktop product range; Tahiti XT (AKA R9 280X) had been retired, and a Tonga XT model had never been released. Interestingly, it’s been known for some time that a Tonga XT (i.e. full-fat Tonga) did exist. Tonga Pro, like all the Pro versions AMD’s most recent generations of GPUs, are binned GPUs with disabled Compute Units, either because they never met power targets or minor errors in fabrication demanded that a bank of CUs be fused off. The surprising aspect of this is that the full-fat Tonga’s were never released to the desktop market (as a R9 285X for instance). As it turns out limited quantities of the Tonga XL were available as the Radeon R9 M295, AMD’s flagship mobile GPU; it was never revealed why the design never made it into the desktop range. Today that is about to change as AMD are preparing to release the Radeon R9 380X, built on the Antigua XT GPU which in tern is a more mature version of the Tonga silicon. Set to go up against overclocked models of NVIDIA’s GTX 960, the R9 380X is designed for gaming at high quality image settings up to a resolution of 1440p. Unlike previous R9 300-series graphics cards, the performance of the R9 380X is largely unknown. There’s no 200-series SKU to compare it against directly, and as a result of the 14% increase in the number of Shaders/CUs it should greatly outstrip the R9 380. It will also feature 4GB GDDR5 VRAM, rather than include both 2GB and 4GB SKUs, making baseline models more suited to high-resolution gaming than its lesser kin. In essence it has all the making of a GPU to really shake up the mid-range. 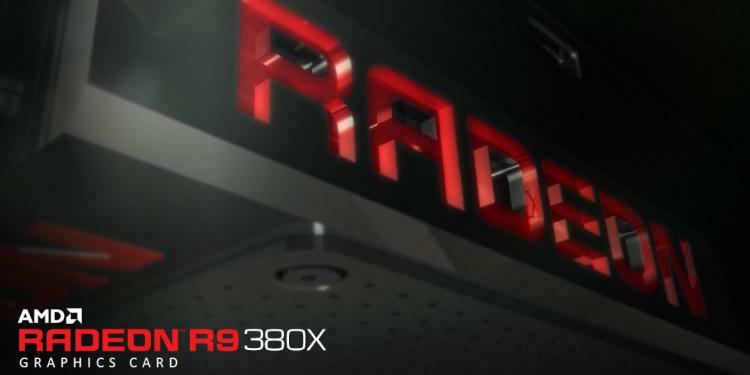 Given its pedigree it will be of little surprise to know that the Radeon R9 380X supports all of AMD’s complementary technologies, including the Mantle/Vulkan low-level APIs, FreeSync, Frame Rate Target Control and Virtual Super Resolution. Spotty support was a pretty significant bugbear in the 200-series, and was one of the driving forces behind standardising the 300-series. Support for FreeSync and FRTC in particular is important for the R9 380X. Adoption of FreeSync by the LCD panel industry continues apace, especially in the burgeoning 1440p and 4K market. In the past however hitting a consistent minimum of 60fps at 1440p was a major challenge for GPUs, so an affordable solution that provides an excellent experience even when performance infrequently dips below this critical value is a real boon to consumers. 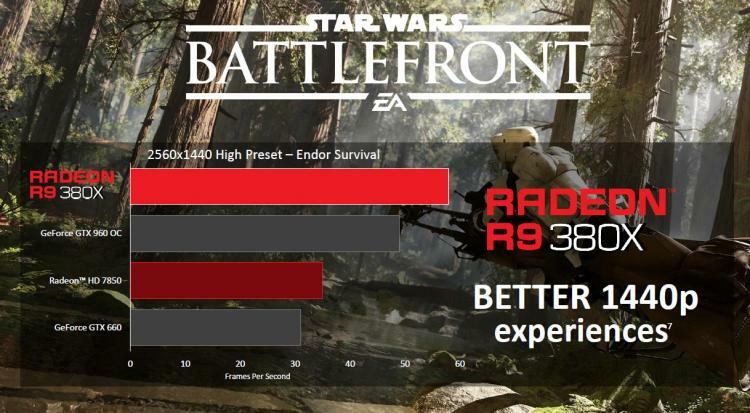 AMD is keen to boast of the potential performance of their new GPU, and what better game to benchmark it against that the latest offering from EA: Star Wars Battlefront. Claiming over 50fps average at 1440p (High Preset), AMD’s own benchmarks place it handily above the GTX 960 OC, the card's chief competition. Just as importantly AMD target better than good frame rates in a host of modern games, rather than focussing on older titles in their marketing. From the outset partner designs with factory overclocks will be available at launch, benefiting from higher quality cooling solutions, component selections and QA processes. Solutions will include models with over 1GHz engine clock and 5.9Gbps effective memory, such as the R9 380X MYST Edition from Powercolor. So, what does the pricing look like? 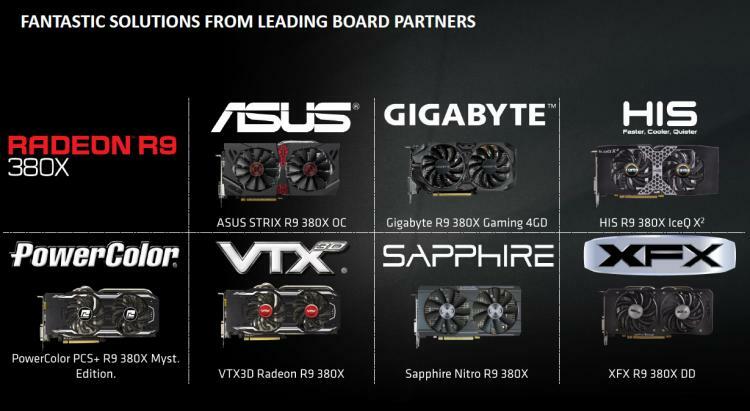 Interestingly AMD are launching the card aggressively rather than simply bisecting the R9 380 and 390; R9 380X’s MSRP is $229/£185 inc. VAT, whilst partner models will start at $239/£195, putting on a par with NVIDIA’s GTX 960 4GB. General market availability is scheduled for 23rd November in the UK. If it can achieve the claimed performance overhead versus its rival the card could very well be a new <£200 pound-for-pound leader in an extremely competitive marketplace. 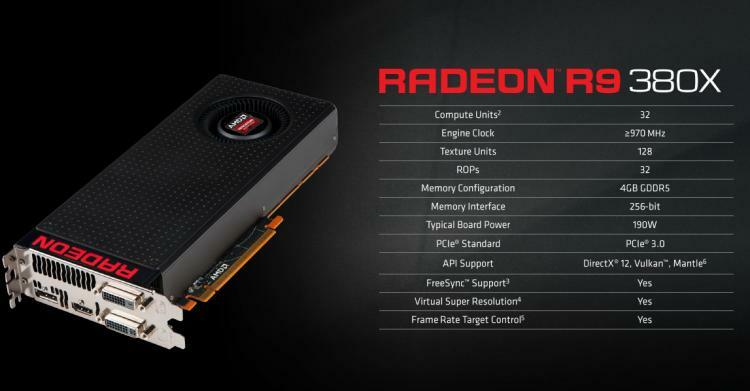 You can find more information on AMD’s GPU technologies at AMD.com, and also will remind you that Radeon Software Crimson Edition is also due to release in the near future.